With its elegant shape and delicate silvery-pink color, this unusual lily-flowering variety creates a glamorous exhibit in the garden—especially when planted in large groupings of five ore more. Silver Ballade produces almost iridescent blooms of pink with a silvery sheen, dark pink midribs and silver edging. 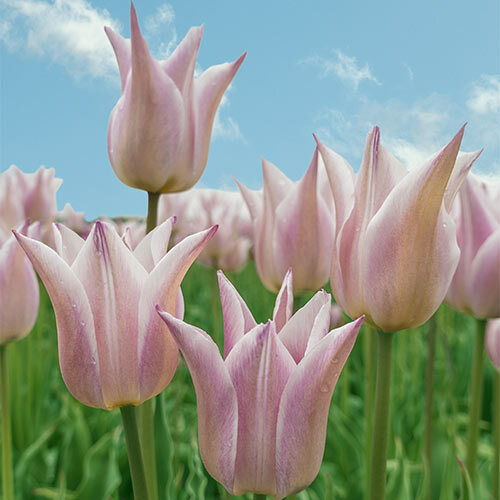 It's an enchantingly unique tulip that resembles a graceful ballerina—gorgeous in late-spring borders as well as tucked into a softly hued cut-flower arrangement. We like to plant these beauties alongside white varieties or deep blues for a sophisticated, designer-inspired display. Silver Ballade is limited in availability, so be sure to order plenty for your customers.